The longing stretch toward the infinite . . . the reluctant embrace of the temporal. This is the eternal lot of mankind. 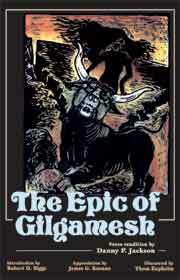 This is The Epic of Gilgamesh. Our revised 2nd edition of mankind's first epic features a lucid historical and cultural introduction by Dr. Robert D. Biggs, a new interpretive essay on the themes of Gilgamesh by Dr. James G. Keenan and their echoes in other literature, and the ancient world as well as original illustrations. Though The Epic of Gilgamesh exists in several editions, this version has been undertaken with a very specific intent—to remain faithful to the source material while attempting to convey the poetic scope of a work that is both lusty and tender and that retains the ability to arouse compassion and empathy in all who follow Gilgamesh on his journey. This edition aims to reanimate the story of Gilgamesh and Enkidu for all readers, bringing it new life through the addition of reader resources and a rendition that resounds with indelible poetic images. The Bolchazy-Carducci edition of The Epic of Gilgamesh has gained impressive recognition in the publishing world. First, it was chosen by Prentice Hall for Literature of the Ancient World, vol. I (New York, 2000). Then fine art publisher D. G. GraubArt chose it for their lavishly illustrated Hebrew/English edition, The Epic of Gilgamesh: A Myth Revisited (Jerusalem and Wauconda, 2001). The Great Books Foundation has added the Jackson's rendition of The Epic of Gilgamesh to its "Great Conversations"∫ series (Chicago, 2004). Finally, in 2005 this book was republished in its entirety in Turkish. This is an excellent achievement. It makes this great work accessible to college and general readers. ...there are at least two audiences who will derive much pleasure from this latest attempt to breathe life into the dead bones — or sundried clay tablets — of this old epic. Jackson’s version tells the story in a clear and effective fashion, with attention to levels of language and narrative form. The first is students in university Myth classes, who will be able to grasp the story and its characters without being confused by scholarly minutiae.... The second is those who are seeking in translations from the West’s rich past a way to resurrect the art of poetry in our day, or to initiate its resurrection in the next generation. As a whole, Jackson’s work is lively, exciting, and dignified. Aiming to make this archaic story more accessible, the book features an introduction replete with black-and-white archaeological photographs to help create the ancient context of the story; gorgeous...woodcuts illustrate the text; and flowing, vivid verse enhances this translation. Gilgamesh permits us to tie the ancient Near East and the ancient Mediterranean together like nothing else....These unifying tie-ins make it logical to use Gilgamesh as a lead-off text in a classical mythology course. The Bolchazy-Carducci edition, more readable than its predecessors, makes it practicable. Students liked it, and for the professor it is one light bulb after another. Excellent introduction to a masterfully translated text that is simple, direct, and thought provoking...This is by far the most lucid edition I have read. Your new text is most impressive! Because of its ease in reading and its visual appeal, some of my students have expressed an interest in using it as a subject of research papers. It makes very vivid for the reader the character of the poem as a pilgrimage through the delights and sadness of life. ...you are to be congratulated on providing a reasonably priced student edition to this great epic that will make it very accessible to a wide audience. The best text on the market. The text is excellent in its clarity of story line and motif.